You are here: Sports Betting Online > Sports Betting Weekly Updates >	Women in Darts – Future World Champions? Women in Darts – Future World Champions? We were sitting in the pub watching a terrible game of darts in the early stages of the BDO Women’s World Darts Championship. Low scoring, bad doubling, a lack of excitement. It was miserable viewing. I found myself accepting it as fact that women just aren’t good at darts. That this poor standard was all we should ever expect. However my drinking buddy Ciaran suggested they should be far better and he had some interesting ideas why. He claimed darts is one sport where there is no real barrier to female success. The darts weigh next to nothing. Height is no clear advantage. Strength and power don’t matter. The required stamina to play a 60 minute game is achievable by all. Anyone can do a bit of subtraction from 501 down. Things like that. He made a strong case. And his killer point was that darts is fundamentally similar to archery – and in archery there isn’t a whole lot between the world record scores of men and women. I was very dubious about this but a quick google revealed that it’s actually true. Now I suspect that most records in archery have been accomplished in perfect conditions and so may not be a great guide. Male strength may be important when the wind is blowing and conditions are less than ideal. But it still indicates that the gap between men and women in archery is at most somewhere around the 5% mark. So how about we translate that to darts? Nowadays the top 10 male players regularly gets a 3-dart scoring average of 105. Therefore we could expect the best women players to average in the high 90s and to often break 100. And because of the strange way averages work that should mean that women are capable of winning matches against the top male players. Potentially winning tournaments. From everything we have seen of women’s darts up to now that seems very unlikely. However as punters it’s important we remember that just because something hasn’t happened yet doesn’t mean it can’t happen in the future. Get the best odds on BDO and PDC darts with our selected bookmakers below. Armed with this bit of sporting knowledge I went into my local independent bookie for a casual chat about nothing in general. Gradually moving the conversation onto darts of course. And ended up being offered £50 at 25/1 26.00 +2500 25.00 25.00 -0.04 that a woman reaches the quarter-finals of the PDC World Championship by the end of 2029. I took this bet though I’m not really sure whether I’m on the good side of it or whether I’m the mug. Other sports give me hope. Archery as mentioned. Shooting as well. Chinese lady Zhang Shan won gold ahead of the men at the Barcelona Olympics. Shooting is somewhat similar to darts surely? The likes of soccer, rugby and other contact sports are clearly no help. In golf the longer distance that men hit the ball is an impossible barrier. In tennis you might expect spin and subtlety would have a chance. However generally men have beaten women in exhibition games with the exception of Billie Jean King’s dubious win over Bobby Riggs. The recent hyped encounter between Roger Federer and Serena Williams was in mixed doubles so was no real guide. Horse racing is the great example where the glass ceiling has been shattered. It barely merits a raised eyebrow these days when a female jockey wins a Group One on the flat or over jumps. The likes of Julie Krone, Alex Greaves and Nina Carberry have led the way and proved they can compete and win. 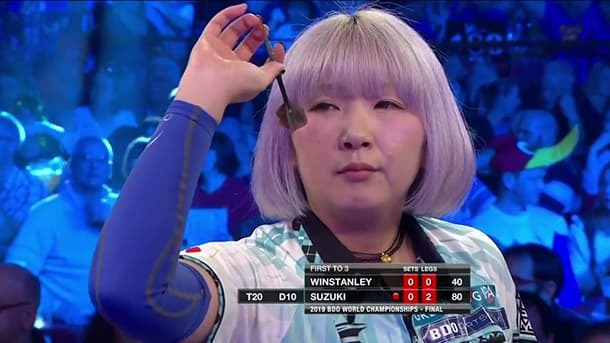 Mikuru Suzuki picked up the 2019 BDO Women’s crown in January with a match average of 90.12. That average won’t be troubling the likes of MVG or Rob Cross anytime soon, but it was only 1 point lower than the average Scott Waites posted while losing in the men’s final (91.38), and significantly better than both Waites and Unterbuchner’s paltry averages of 85.30 and 83.23 in the semi-final. So back to my £50 at 25/1 26.00 +2500 25.00 25.00 -0.04 for a female darts quarter-finalist by 2029. Short-term it’s not going to happen. My hopes are therefore pinned on the second half of the decade. I’ll file my docket away and hope it eventually turns into gold. In the meantime we have the Darts Premier League starting soon with 9 of the top players (and Raymond Van Barneveld) taking part. Something to look forward to after being starved of TV darts for the last few weeks!